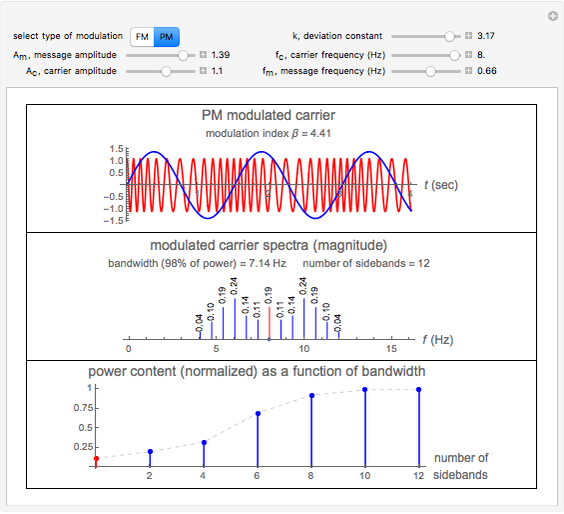 This Demonstration illustrates frequency modulation (FM) and phase modulation (PM) using one sinusoidal tone as the modulating signal. For FM and PM, the modulating signals are defined by and , respectively, where is the signal frequency in Hz, and is its amplitude. This definition for is used to simplify the spectra of the modulated carrier by using Bessel functions of the first kind (BesselJ in Mathematica). 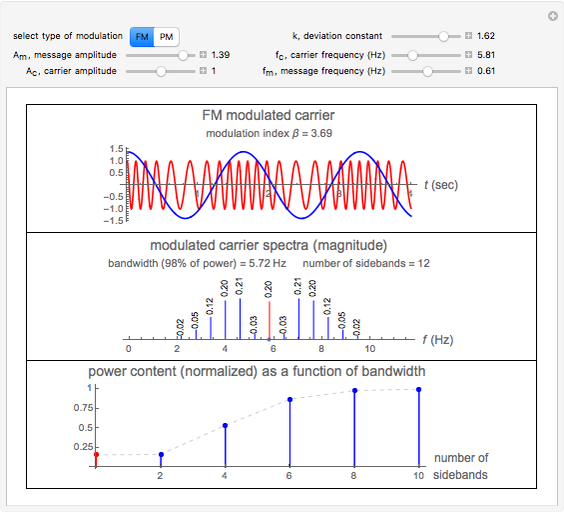 With defined as above, the modulated carrier can now be defined as , where is the modulation index, is the carrier frequency in Hz, and is the carrier amplitude. The bandwidth of the modulated carrier is defined as approximately . This bandwidth contains 98% of the power. 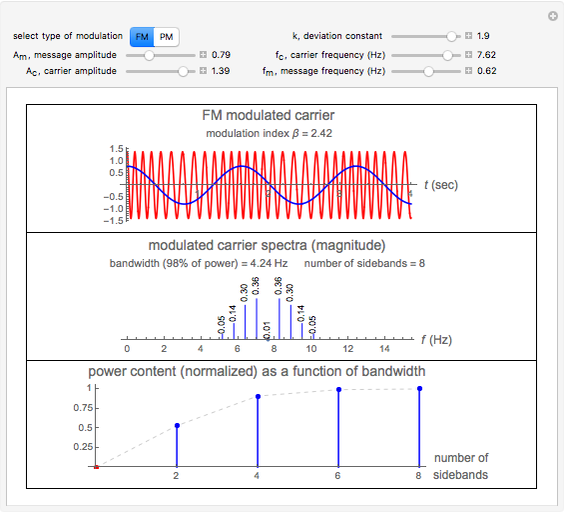 For very small the modulated carrier spectra become a narrow band and for a large the spectra becomes wideband. The parameters can be adjusted and the effect on the spectra of the modulated carrier can be observed. This Demonstration also calculates and plots the (normalized) power content of the modulated carrier as a function of the bandwidth. This is also called the power ratio, and is defined as , where is a Bessel function of the first kind and is the number of sidebands on each side of the carrier frequency . 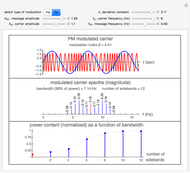 This plot is useful in the design of FM and PM modulators as it allows one to determine the size of the bandwidth needed for a given power ratio. Nasser M. Abbasi "Power Content of Frequency Modulation and Phase Modulation"